Home → Travel & Event → Cherry Blossom Season is here! It’s an exciting and magical time for both visitors and locals alike around Japan as people wait for the Sakura to open and be in full bloom. Timing is everything as the total time from the opening of the first blossoms to the full bloom to them eventually falling from the trees is over typically within two weeks. The main factor that determines the time of the blooming is the geographical location and the climate. In the southern Islands of Okinawa the Sakura can bloom as early as October whereas the northern island of Hokkaido can be as late as May. The timing can be greatly affected by the weather with colder weather delaying the flowers. Year to year the blooming season can vary by +/- 1 week due to this but larger time scales are also possible so it can be quite hard to predict the short time scale with many factors having to be taken into account. Every year weather services and news outlets try their best to follow the ‘cherry blossom front’ as it moves northwards over the country. 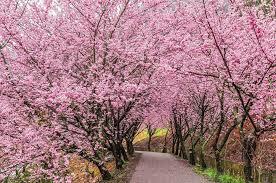 Because of the trees different locations and amount of sunlight they receive across each city and region the trees can bloom at slightly different times so a sample tree is selected and once more than five blossoms have opened then the season in that area is officially declared as started. This Thursday in Tokyo the sample tree in Yasukuni Shrine in Chiyoda Ward started to bloom and all the trees around Tokyo are expected to be in full bloom in around 7 days from the announcement. Nagasaki Prefecture on Wednesday was the first to see Sakura bloom this year. Below is a chart with the predicted times of the blooms in each of Japans regions. If you can make it I can imagine it is an amazing and beautiful sight to see. The cherry blossom festival is known as Hanami and is a very fun and important custom in Japan that goes back more than 1000 years. 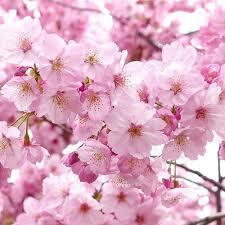 Hanami literally translates as ‘viewing flowers’. 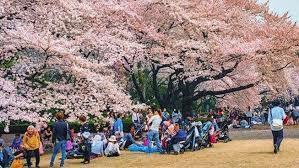 It involves going and enjoying the Sakura and sometimes the plum blossoms (Ume) with friends and family in parks and having picnics and drinking under the beautiful trees. The whole event gets very competitive in securing the best spots in the parks and people stake their spot from early morning or even the night before. A lot of sake generally flows throughout the day so the festivities become more party like and people enjoy a lot of good natured revelry. 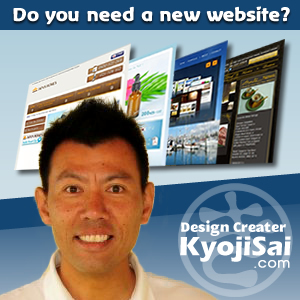 You will definatly have to learn the phrase Kanpai! So you can join in a cheers your new like-minded friends. Because the cherry blossoms are beautiful; and don’t last long they have become a symbol in Japan of ‘mono no aware’ or ‘nothing lasts forever’. It is a reminder that life is beautiful but tragically short.